I dreamt of moving to Ebbsfleet. My father and brothers were working in the cement quarries. I helped my mother at home: washing, ironing, cleaning, cooking and baking. Tall smoky chimneys towered over us and we were permanently covered in white dust which found its way into nostrils and ears and tasted vaguely limey. We shouted over the endless cacophony of industrial machinery, the hissing of steam, the clank and grind of trams and the workers’ cries. We held the Owner in respect: he was reputed ruthless. Cross him and we would not eat. I dreamt of moving to Ebbsfleet, a new town redolent with promise, a garden city in its infancy, brimming with potential, yet built on the solid foundations of Kent’s industrial heritage. Ebbsfleet Garden City: commanding breathtaking views over the Estuary; boasting a spectacular topography of chalk cliffs, secluded limpid lakes, hills and viewpoints; benefiting from its proximity to the traditions and graceful architecture of Dickens’ and Turner’s Gravesend and the contemporary convenience of Bluewater shopping centre. I dreamt of moving to Ebbsfleet: I counted my life away: fifteen minutes’ bicycle ride east to find a proper swimming pool and fifteen minutes west to access the river, twelve minutes on the bus to see a film at Bluewater. It’s just seventeen minutes to town: the last train back, like Cinderella’s carriage, leaves at midnight. I dreamt of moving to Ebbsfleet, but the idea of moving to this not-half-built wasteland put me in a panic. I would fail to fit in to the community: I’d forget to weed the drive, I have no kids and no aspirations. Growing up among decent people I felt the punishments meted out to those of us who don’t buy the dream: those who want something different. I ran away from Weybridge and I would run away from Ebbsfleet. I dreamt of moving to Ebbsfleet. I was in a quarry from which there was no escape – everywhere I tried to run there were barriers: unscaleable white cliffs, sealed tunnels, stretches of water that I couldn’t reach, railway lines that didn’t connect, roads with relentless streams of traffic, and, between me and the mighty Estuary, a high-security fence. I dreamt of moving to Ebbsfleet. We were kings of a castle with outline planning permission only, built on landfill. We leapt with giant steps from cliff to cliff, escaping those imprisoning ridges. We held back the bulldozers to save the estuary marshland from destruction for a theme park employing local youth on zero-hours contracts. We dragged the three discrete railway lines and knitted them into a network of exchange and interchange. We trod joyfully over the caravans of cars stationary on the ancient highway, as congested with traffic as it ever was with mud in the days of the stagecoach. We were mermaids with siren songs: pilots for Thames Clippers, avoiding the collision that sank the Princess Alice and drowned seven hundred day-tripping Londoners on their cheery return from Gravesend. I dreamt of moving to Ebbsfleet and I saw a construction; I saw a vision and a place of dreams; I saw realities; I faced my fears: I had a nightmare; I dreamed fantasies and fictions, stories and myths: fairy tales. I saw a lack of construction: I dreamt of moving to Ebbsfleet, but, even granted a fair wind blowing from London, I’ll be 78 before it’s finished. I dreamt of moving to Ebbsfleet, but caught the 17.38 back up to town, to grow old where I belong. Dreams are moths’ wings. I caught the 17.38 to where no-one notices whether or not I belong. Artists rent studios for different reasons: for the physical space to paint, sculpt or build an installation; for the mental and physical space to make work away from other commitments; maybe even to authenticate, for themselves, that they are an artist. Artists also rent studios to feel part of a community of artists. In reality most of the studio buildings I am familiar with have a limited sense of community. One sees another artist filling the kettle from time to time, and often they will say hallo. Sometimes one makes the effort to introduce oneself, but generally the relationship extends no further than hearing the sound of their arrival or departure. In spite of this I am lucky enough to feel part of a community of artists. I share a large and beautiful studio in ACAVA’s Limehouse Art Foundation with the three other artists who were awarded the 2018 Artquest Lifeboat residency. This is the first year that Artquest has offered the Lifeboat residency to a group of four, rather than to four individuals, and for us it was a real incentive to apply for the award. Even though our practices, backgrounds, interests and ages are very different, we have successfully established a sense of community between ourselves and with our peer mentoring group. My own practice is based on an exploration of difference and has its foundation in feminism. I’m really interested in the writings of the Milan Women’s Bookshop Collective from the 1980s. They write about how important it is to do things together. They see this as a way of building a sense of community and mutual support between people who may have nothing in common other than a shared commitment or project. That’s how we can build an appreciation of difference – through valuing and enjoying each person’s distinct contribution to a common goal. As a community of artists we four Lifeboat artists cleared out and cleaned our studio together and made it comfortable and hospitable; we help each other out; we run a peer mentoring group together, funded by Artquest; we give each other informal crits on request, and we are planning Open Studio and then a show or event together. We communicate– in person, by email and by WhatsApp – so that everyone knows what’s going on with practical issues. We encourage and congratulate each other and commiserate when necessary. We take the mickey out of each other and make each other laugh. There’s a lot to be gained from being part of a community of artists, and a studio has the potential to be the perfect setting for that way of working. In practice though it may work better to establish a community first and then find a studio. There’s different options for doing that – for example forming a group and then moving it in to a shared studio, or bringing together a peer mentoring group. This may be more successful than relying on building a community with one’s neighbouring artists, with whom one may have little in common either in terms of practice or priorities. Building and maintaining a community does take time, and it does require people to share responsibility for different tasks, although that will always be in proportion to their other commitments. Sharing the studio has benefited me and my practice. It’s much more enjoyable to be there with someone else. It’s a real incentive for being there: time goes much more quickly, and, oddly, seems much more productive, than being there alone. We are considerate when we are sharing the space so that we don’t disturb each other. But we do chat a bit and I’ve had helpful crits from all the other members of the group. And there’s something about witnessing the diligence of other artists – seeing behind the scenes, as it were – that makes me feel better about spending three months of intensive effort in producing a seven-minute video. The practicalities of being in the studio – snatching time away from family, friends, children, ageing relatives, partners, paid work, a social life, gardening, decorating, seeing exhibitions or concerts or films, cleaning, doing the shopping or going to the gym– or to the pub – to carve out time to Make Work mean that when one is in the studio that’s what one is going to focus on. In reality the studio is a setting for getting on with it – not for planning joint shows; sharing resources; doing crits, or providing mutual support. However all of those activities are crucial to maintaining our commitment, our standards, our morale and our focus. What our group has managed to do – using the framework of the Artquest Lifeboat residency – is to build systems of mutual support. Our own community is our improbable group of the four Lifeboat artists and our wider Peer Mentoring Group of twelve artists. So we feel connected and supported and justified in making work. It makes us more productive. And we have a laugh. Sabrina Fuller is one of the recipients of the 2018 Lifeboat Residency. Lifeboat is a year-long studio residency and peer mentoring and career development award for MA postgraduates from University of the Arts London. The other artists selected for the 2018 award are Davide Meneghello, Mētra Saberovaand Jojo Taylor. The residency is funded by ArtsTemps and supported by ACAVA. More than halfway through the year of our Artquest-funded peer mentoring group it seems valuable to reflect on what is, up to this point, working well, and of any issues it is worth considering before setting out to run one’s own peer mentoring group, whether externally funded or not. So far it’s been exciting and a lot of fun – working with an international and intergenerational group of artists. The basis of our peer mentoring group is the Artquest Lifeboat group residency which the four of us – Jojo Taylor, Davide Meneghello, Metra Saberova and I – were awarded in January 2018. As well as a beautiful studio in ACAVA’s Limehouse Art Foundation and funding for six mentoring sessions, the funding for the peer mentoring group is a key element of the residency. Our proposal for the group was an important part of our application for the residency. 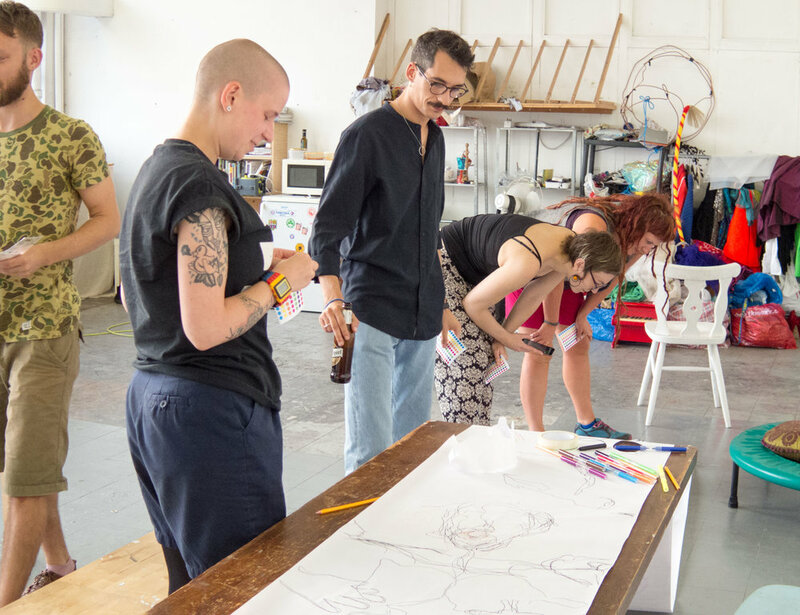 From the start we were clear that the peer group should form the basis for future networks, so that the way the group is organised explicitly aims to build robust relationships between the different artists involved. The requirements for the peer mentoring group funding are quite specific and are set out in a formal between myself as lead artist and Artquest. This requires that we hold eight meetings in the course of the year, the meetings to be held in the studio, that we should involve between eight and twelve artists including the four of us. The funding can be spent on refreshments, speakers and equipment, as well as payment for our own time spent on organisation. As lead artist, I wrote the application and organise the peer group meetings – all very much in collaboration with the other artists. This is time-consuming, and can get in the way of making . Artquest recognise this and part of the funding can be used to pay for this , although we are trying to maximise the proportion of the funding going in to directly supporting the group. The four of us from the residency each invited two other artists to participate in the group. Our criteria were that we should invite practicing artists, with a collaborative nature and who, geographically and in terms of other commitments, would be able to attend the meetings. The outcome has been the formation of a group of very different artists, at varying stages of their careers and who are kind, interested, committed and mutually supportive. What binds us is our positioning ourselves outside the mainstream – taking a position or positions of ‘other’ in order to better critique the present, whether that is from a queer or feminist perspective; from the standpoint of carnival or vaudeville; from a basis in trauma or vulnerability, or in a new materialism which implicates us in matter and mutability. We’ve formed a collective, with a name and a statement: BLUNT is a collective of international and intergenerational artists who support each other in their exploration of subjectivities, entanglements and transformations through performance, participation, still and moving image, sound, sculpture, body art, drawing, painting, writing and the archive. They are Metra Saberova, Davide Meneghello, Jojo Taylor, Sabrina Fuller, Sean Burns, Daria Blum, Krasimira Butseva, Sarah Carne, Mark Golby, Margaret Leppard, Madeleine Lohrum, and Andrew Rickett. Our explicit aim -to build relationships between us – is supported by all that we do. We eat together at the beginning of each meeting, around the big studio table– the ‘family meal’ – delicious vegetarian food from our favourite East London curry house. We have refreshment available during the meeting – taking in to account that most people are coming at the end of a hard day. We try to make sure that everyone feels that their attendance is valued. We had originally proposed that meetings would include both crits and workshops. When, at the first meeting, we consulted all the group members on our plans, it was agreed that this was over-ambitious. Most of our meetings include group business and planning as well as a catch up on the projects each of the group members are involved in. Then we have two or more crit sessions. These last half an hour or so, which is never quite enough time. Crit sessions aim to be constructively critical, challenging, but, above all, . Our meetings start promptly at 6.30pm (prompt arrival is explicitly encouraged so that we don’t run out of time, although we recognise that some people will always arrive late because of work and other commitments) and finish at 9.30pm to give people time to get home, as a couple of our members are based outside London. The eternal problem, that we are always short of time, feels like a good sign. We also have a programme of workshops run by members of the group– so far we have had a workshop on confidence and another on expressing our practice non-verbally, with more to come. Running workshops is one way that we get active involvement from all the group members. We’ve also had different people leading the meetings and a meeting which focused on what we could develop as a potential theme for a BLUNT group show, and now have a volunteer to lead the curation of the show. One group member runs our Instagram account (@BLUNTBLUNT), organising regular take-overs by other members of the collective, someone else our Twitter account @BLUNTcollective, and a third set us up with a shared drive and email. This all fits with the notion of building relationships through working collectively towards shared objectives, such as organising Open Studio and a group show. BLUNT has enabled us to get to know some very different and interesting artists and their work: some great people to be around. The aim is for BLUNT as a collective is for it to develop a life which, in some way, will continue past the end of our Arquest residency. We believe that, through taking on different roles in order to support that shared aim and through working together to achieve that, we will build and strengthen our relationships and networks for the future. 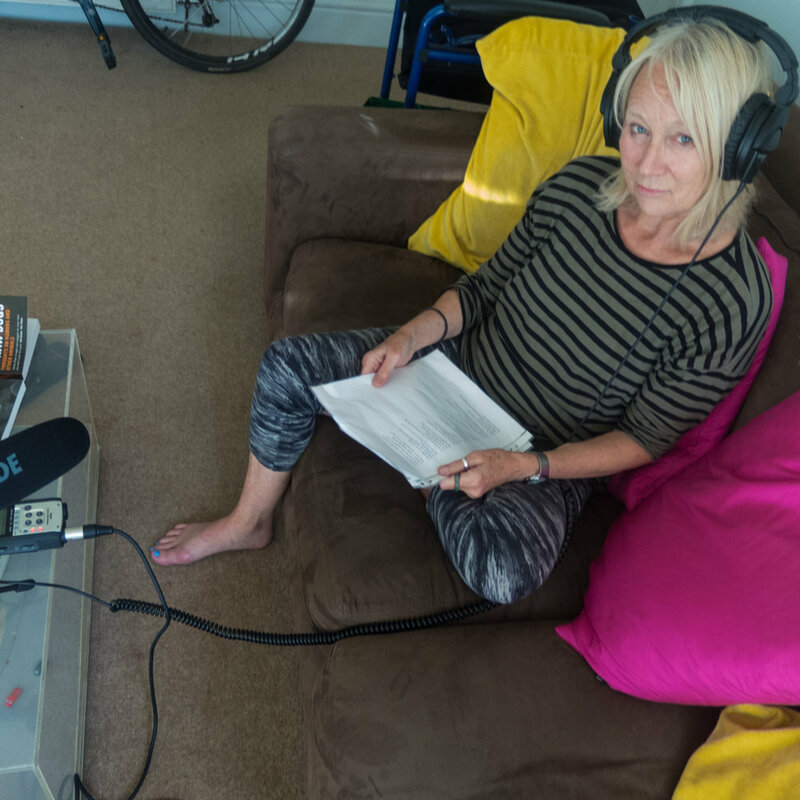 Thanks to Liz Sherwood, Ellie Sherwood, Kathryn Hardy, Ana Domenech, Eve Redmond, Ruby Sherwood Martin and Barbara Singleton for giving voice to seldom heard women prisoners' testimonies for my sound piece Away, in VACANT. IN USE, part of Deptford X fringe.